Engineering services performed during construction are critical to project success. Our engineers and technicians have the experience needed to look out for the interests of our clients throughout construction. From office work to onsite construction observation, our goal is to deliver complete owner satisfaction with the finished product. Production well drilling, alignment, and grouting. Well development, rehabilitation techniques, and test pumping. 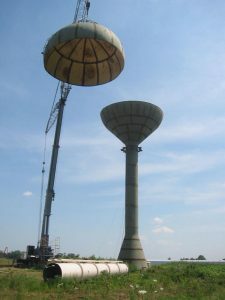 Elevated tank construction, surface preparation, and painting. Water main construction for open cut and various trenchless installation methods. Pumping equipment and complex treatment system component installation. Process piping, HVAC systems, electrical, and controls. Shop drawing and pay application reviews. Construction schedule review and coordination. Responses to contractor’s requests for information. Funding assistance and loan disbursement requests. Attention to detail and a watchful eye has led to a history of low change orders and finished projects that comply with the drawings and specifications.